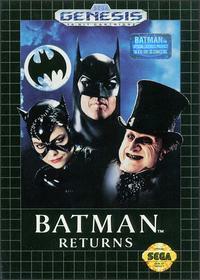 Batman Returns on the NES is a pretty terrific game. 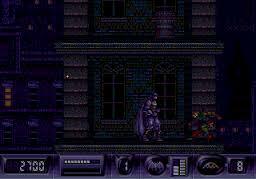 Batman Returns on the SNES is a fantastic game. Batman Returns on the Sega Genesis is one of those constant reminders of why I’m forever grateful that I owned a SNES growing up as opposed to Sega’s machine that I wished I had after being suckered in by flashy commercials and “Blast Processing.” If you’re looking for a great Batman game that lets you play the events of Tim Burton’s second film, you have two well worth playing options on Nintendo’s machines. Those looking for an experience even remotely similar on the Sega Genesis should prepare themselves for a monumental disappointment. Full disclosure, Batman Returns on the Sega Genesis is one of those games that I cannot finish, up there with Superman and Wolverine: Adamantium Rage, also both on the Sega Genesis, perhaps being a sign that the Genesis and I, at least in this genre of games shouldn’t co-exist. Not only could I not finish the game though, I couldn’t get past the first stage, which is a huge problem for any game, especially if you’re a guy like me who’s been playing games for around 25 years or so and has beaten a lot of them with questionable quality. So why exactly is Batman Returns such a bad game? Well, lets start off with the gameplay. As opposed to being a beat-em-up like both Konami games, Sega’s version is a traditional side-scrolling action game, which I like because at the very least, it differentiates itself from the Nintendo platform offerings. Whereas those games were simple but fun, Returns on the Genesis is neither. The controls for both fighting and movement are incredibly stiff, and the pause menu from selecting a series of gadgets, most of which are largely useless, is unintuitive as well. You also have a grappling hook that is put to use much more than either Batman Returns on the NES and SNES combined, but knowing what you can and cannot connect to is a hard thing to determine, mainly because of the games graphics. 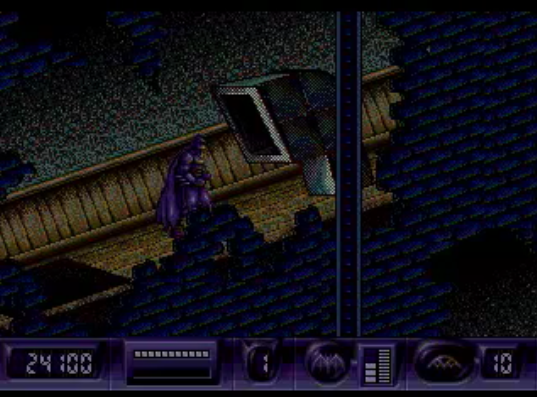 Even on the NES Konami did their best to replicate Tim Burton’s vision of Gotham and did so excellently on their SNES game, Batman Returns on the Sega Genesis features buildings that look like they could have been ripped out of any generic game. Worse yet is that you often can’t decipher what is a platform you can jump on and what you’ll fall through. Compounding this is that as early as stage 1-1, pitfalls exist that you can’t see because you can’t scroll downwards, so prepare to see a lot of your paltry list of lies eaten up quickly like I did due to not knowing what kills you can what doesn’t. Need I remind you again that I’m referring to stage 1-1. I wanted to give the Sega Genesis’ Batman Returns game a fair shake, just like I did for the other two games I’ve reviewed, but as early as the first part of the first level I quickly realized enough was enough. The gameplay is bad, the graphics are not much better, and with two other much better games bearing the name “Batman Returns” on the market, there’s no reason for anyone to pick this up. When I review a game I always try to finish it to see if something falls apart or gets better, but in the case of this game, I can’t think of anything it could have thrown at me to make me say this is worth anyone’s time. This is the coal in the stocking equivalent of a Batman game.